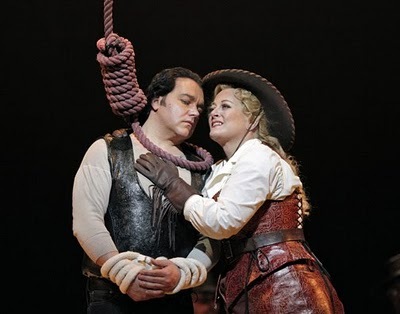 Earlier this summer, we went to see Puccini’s opera The Girl of the Golden West . Which was quite the spectacle, but my first thought after it was over was “after this, I’d better not hear anybody ever complain about video game plots again!” Its plot was threadbare and ridiculous; I’ve certainly played video games with worse plots, but most of the narrative video games I’ve played this year did better, some of them significantly so. The thing is, when judging an opera, that doesn’t matter! Perhaps that’s a bit of an exaggeration, but really what I’m looking for in an opera plot is something that supports a string of scenes in which characters can break into song and make beautiful music together. I didn’t actually think The Girl of the Golden West was very good, but the plot had nothing to do with that: the plot served its role adequately, I simply didn’t like the music. Which leads us to video games. If these well-respected art forms can use a threadbare narrative as a vehicle for glorious set pieces, why on earth shouldn’t we do the same? 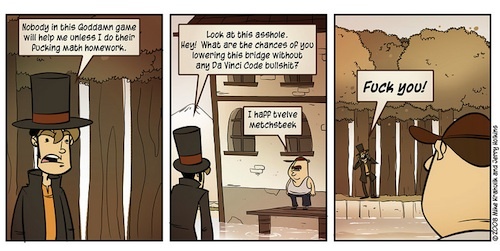 Take Professor Layton as an example: it has a plot, it’s a pretty silly one (though no worse than the ones in the works mentioned above), but the game’s designers manage to shoehorn the plot into an excuse to throw puzzle after puzzle at you. And the puzzles are awesome, and that awesomeness is enriched by the art work, the music, and even the plot that surrounds them. I am not proposing this aspect of operas and musicals as a general model that all video games should follow: non-narrative video games are just as valid as non-narrative music is, and for that matter video games are so multifaceted that they’re entirely capable of learning from the virtues of any other art form. (We need more experimentation with the possibilities of video games, not less!) But I think it’s a useful counterpoint to the comparisons of video games to movies: consider thinking of narrative as a cord to string pearls along rather than as diamond that, while horribly flawed, nonetheless makes the rest of your game look tawdry. Or, perhaps, give up on similes entirely: that’s a pretty bad one. But, if you follow me down this route, I have one last suggestion: consider the sorts of narratives that you do find in operas and musicals. There are certainly opera narratives that are as grandiose as any video game plot, the Ring being the most obvious example. But a lot of them are rather slight, quite aware of the supporting role they play, dancing lightly along with the music, with even tragedies not expecting the world to be consumed by their grief. Shouldn’t more games do the same? Focus on your gameplay set pieces, get them right, and let the story skip along with them. And, while you’re at it, maybe consider following musical forms and make those set pieces rather shorter, too. Mitch Krpata recently wrote a parody piece injecting Hydro Thunder into the “games as art” debate. The thing is, I played that game with friends last Thursday, and we all had a great time, because the game did such a good job of helping us focus on enjoying our play together in the context of the constraints that the game placed on us. And it did this while treating the context that surrounded that gameplay respectfully but not particularly seriously. So yes: art it is, and my world is richer because of it. This is something Tom Bissell talks about in Extra Lives and on the Brainy Gamer podcast, and I think you’re both spot-on. The key for me is treating the narrative respectfully, as you say. There are far too many games that insult our intelligence by having stupid or poorly executed plots. (Here we can wrap in a bunch of familiar criticisms: uninspired voice acting, uneven pacing, an overreliance on cliches, etc.) Threadbare narratives are one thing; bad ones are another, and are manifestly avoidable. In regards to plots: I actually will stand up for cliches, to some extent. 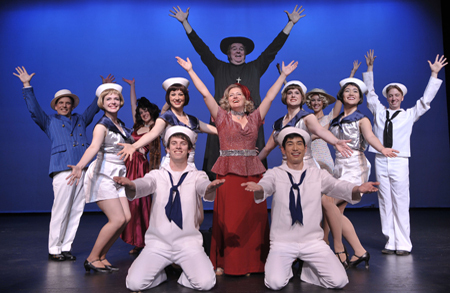 I’m pretty sure that you could find characters like those in Anything Goes in a fair number of other works, and that didn’t harm it for me at all. Though I could be wrong there – maybe if it had been really steeped in cliche then the boy would have fallen in love with the girl who loved him rather than the glamorous girl he’d been pursuing? And I am tired of the ‘teenage boy saving the world’ cliche in video games, that’s for sure. Certainly there’s no reason for bad voice acting and uneven pacing, though – they might not be quite as deadly in a video game as they would be in a musical, but they hurt, and, as you say, they’re manifestly avoidable. I’ve never been able to engage with opera, but I enjoy musical a lot. And it’s definitely the case that while a few musicals aspire to a literary tone (Les Misérables), most are just about the music. Of those, many are based on existing material. The thing is, it doesn’t really diminish them at all. As you note, games can similarly succeed. Torchlight, anything with Mario, etc. I’d love for more games that are just about gameplay to lose the self-seriousness and focus on what they’re good at. And just as importantly, for more folks to appreciate a game for what it is. There’s plenty of space for certain titles to aspire to greater heights, but for those don’t, they’re fine by me too. I would say that, like anything, cliches are useful in moderation. Or, as TVTropes would put it, tropes are tools — in a sense, we need them in order to tell meaningful stories. It’s the overreliance on them, and the lack of variety in their execution, that is problematic. @Dan: Yeah, for whatever reason, the word “tropes” works better for me, too. Nice link. Its a point that needed making. I’m more irked by the story in games like Alan Wake or Prototype than I am by the story in Super Mario Bros. I think an element to consider is ludo-narrative resonance: wherein the interactivity itself marries itself to the story. In a complex, convoluted story which purports to have deep and meaningful resonance for those involved with it, having a shallow interaction, or one that is at odds with the story itself, feels sort-of jarring to the player. Mario Bros has a nice simple story of “Mario looks for his girlfriend, who is lost in a seemingly linear world of ever-present dangers”, so when the gameplay involves moving Mario from one end of the level to the other, it makes sense. There’s no emotional involvement in the narrative, so it doesn’t feel strange that Mario at no point attempts to engage the Koopa Troopers in conversation (or, perhaps, ask nicely for the Princess to be returned). When games introduce characters with emotional depth and then give us no way to control their actions, the story and gameplay begin to rend themselves apart. Far Cry 2, for all its wonderful design, felt awful to me on my first play-through, because I couldn’t understand why my character would converse with mission-specific game characters, but wouldn’t even attempt to talk his way through an armed blockade.